O, that these too too solid tissue samples were free of cross-linked, fragmented, and otherwise degraded RNA. Or that tissue RNA analysis techniques were better at coping with miniscule samples or extreme variability in the abundances of different transcripts. Then the state of tissue RNA analysis would never drive researchers, translational scientists, or drug developers to despair. Well, “never” is probably putting it too strongly. Regardless, investigators who care about the RNA in cell preparations, fresh tissues, fresh-frozen tissues, or formalin-fixed and paraffin-embedded samples—or even live organisms—are always hoping they will find better techniques for the detection, extraction, and analysis of tissue RNA. Such techniques are, in fact, emerging. They promise to help investigators more finely dissect RNA-influenced molecular processes and cellular functions. Although RNA from archival tissue samples is a rich source of clinical information, these samples are usually preserved by means of formalin fixation and paraffin embedding, which damages RNA molecules in multiple ways (e.g., hydrolysis and covalent crosslinking) compromising downstream applications. 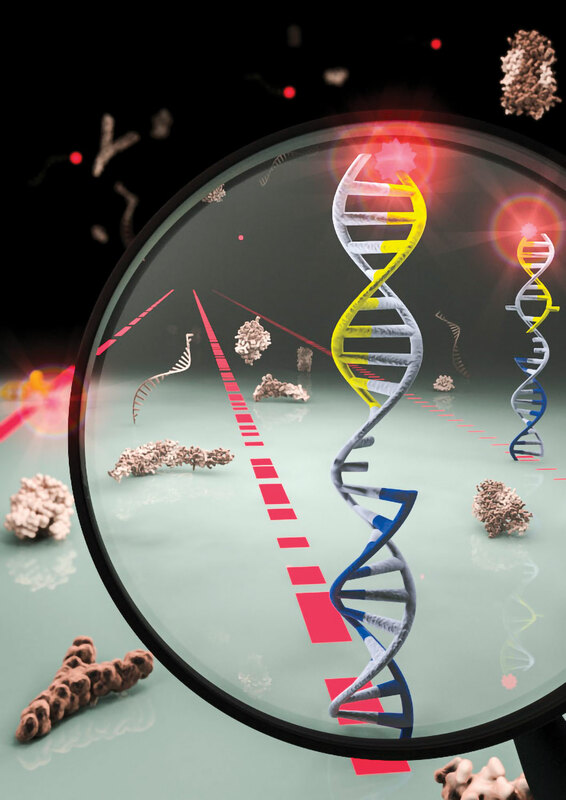 To cope with damaged RNA, a group of scientists led by H. Benjamin Larman, Ph.D., assistant professor of pathology at the Johns Hopkins University School of Medicine, developed a multiplexed probe–based technique. During this ligation event, which can be performed inside the tissue specimen, RNA is essentially converted into DNA, making RNA extraction unnecessary. Accordingly, LISH avoids reverse transcription altogether. “The greatest advantage of our approach is its ability to multiplex,” insists Dr. Larman. This ability affords users the opportunity to select potentially thousands of RNA targets of interest. Also, users may design probes to detect and quantify all the RNA targets simultaneously in a single reaction. Moreover, LISH allows gene-expression profiles to be recovered from extremely small amounts of tissue. “This is very important when examining the tumor microenvironment, for example,” points out Dr. Larman. If the molecular processes in this “tumor microenvironment” could be accurately interrogated, they could inform clinical decisions. They could even enable the use of only the most appropriate therapies for each individual patient, helping to realize an important goal of “personalized” or “precision” medicine. “One of the current limitations is that when measuring hundreds of targets at the same time, we do not determine their spatial location with cellular resolution,” admits Dr. Larman. An active endeavor in Dr. Larman’s lab is to develop a version of LISH that can be implemented entirely in situ. “We would like to visualize the many different RNA targets of interest in a spatially resolved analysis,” declares Dr. Larman. Since the 1990s, the diversity of the functions that biomolecules fulfill inside cells has become more fully appreciated. For example, molecular biologists are more aware of the roles that different RNA species play in processes such as alternative splicing and post-transcriptional gene silencing. “A plethora of noncoding RNAs are involved in shaping gene expression and in mediating epigenetic changes,” says Nils G. Walter, Ph.D., Francis S. Collins Collegiate Professor of Chemistry, Biophysics, and Biological Chemistry at the University of Michigan. He is well aware that over the last two decades, molecular biology has become particularly interested in exploring the interactions of noncoding RNAs with one another and with their protein partners. Gaining an understanding of the structural, catalytic, and regulatory roles played by noncoding RNAs has been challenging for multiple reasons, including large differences in their cellular abundance. For example, while a typical microRNA molecule exists in 1,000 cellular copies, some microRNAs are as rare as 10 molecules in a cell. In a recent study, Dr. Walter and colleagues developed fluorescence-based tools to examine the subcellular location, integrity, and activity of microRNA at single-molecule resolution. “We can localize single microRNA molecules in cells, track them, measure their diffusion constants, and ask how quickly they move between sub-compartments,” asserts Dr. Walter. Using intracellular single-molecule, high-resolution localization and counting (iSHiRLoC), investigators in Dr. Walter’s lab revealed that cytoplasmic microRNAs are more effective in silencing their targets than their nuclear counterparts. Kinetic studies showed that a competition exists between the incorporation of mature microRNA molecules into RNA silencing and degradation pathways, and that an increased availability of Argonaute proteins and RNA targets shifts this competition toward gene silencing. Previously, investigators in Dr. Walter’s lab introduced a technique called single-molecule recognition through equilibrium Poisson sampling (SiMREPS). “SiMREPS can count single unlabeled microRNA molecules without having to amply them,” says Dr. Walter. “This removes some of the bias that could result from PCR amplification.” For short RNA molecules, such as microRNAs, PCR amplification is particularly challenging. In a proof-of-concept analysis, SiMREPS allowed an over 500-fold discrimination between single-nucleotide polymorphisms at the single-molecule level between two molecules. “The types of tools that are needed for the future are the ones that allow us to see biomolecules, including RNAs and proteins, at single-molecule resolution, in cells from tissue sections and eventually in live organisms,” predicts Dr. Walter. Proof-of-concept studies have already been performed and illustrate the possibility of detecting single RNA molecules in live mice. In addition, less and less invasive microscopy probes are being developed to read out signals from very few molecules and, eventually, single molecules in live animals. Figure 1. A technique to detect microRNA has been developed by scientists based at the University of Michigan. The technique, called single-molecule recognition through equilibrium Poisson sampling (SiMREPS), exploits the direct binding of a short fluorescently labeled DNA probe to an unlabeled microRNA analyte immobilized on a glass surface. Dr. Anderson is describing an ACD technology that can succeed where traditional in situ RNA-detection techniques fail in extracting clinically relevant information. The technology, which is called RNAscope, uses a proprietary RNA in situ hybridization platform to detect RNA in intact cells. RNAscope technology, which was introduced in 2011, continues to find new applications. For example, it was recently evaluated as a platform for detecting IDO1 expression in tumor tissue sections. This work was carried out by ACD in collaboration with Incyte, which is developing an IDO1 inhibitor. Incyte scientists presented the results in late January at the ASCO-SITC Clinical Immuno-Oncology Symposium in San Francisco, CA. 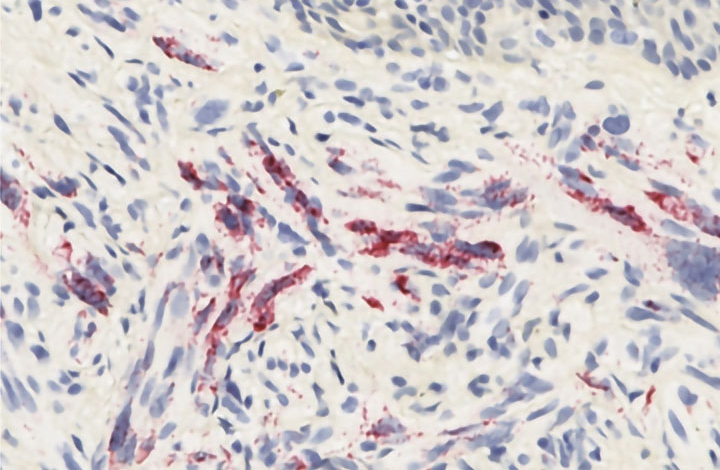 In another collaborative research effort between ACD and Incyte, RNAscope was used to examine IDO1 in human melanoma samples collected during Phase I and II trials (Figure 2). The companies found that RNAscope identified more samples as being positive than did immunohistochemistry. By taking RNA and protein measurements simultaneously, the combination of RNAscope and immunohistochemistry realizes a unique experimental strategy and provides valuable data. “We can look at RNA and proteins at the same time, provided there is a well-validated and robust antibody to detect them,” explains Dr. Anderson. An added value in using RNA measurements is that the detection of some proteins may be difficult. This could be attributable to challenging antibodies, proteins at subcellular localization that are not easily visualized with antibodies, or in instances in drug discovery where antibodies are not available for new targets. RNA analyses were traditionally based on longer probes, making RNA stability a critical determinant of their success. “But RNAscope uses shorter, proprietary ‘double Z’ probes, and this has allowed us to also assay RNA that might be partially degraded,” asserts Silva. Figure 2. Advanced Cell Diagnostics (ACD) collaborated with Incyte to study IDO1 expression in human melanoma FFPE samples. IDO1 inhibitors are now in the clinic for treatment of multiple tumor types. 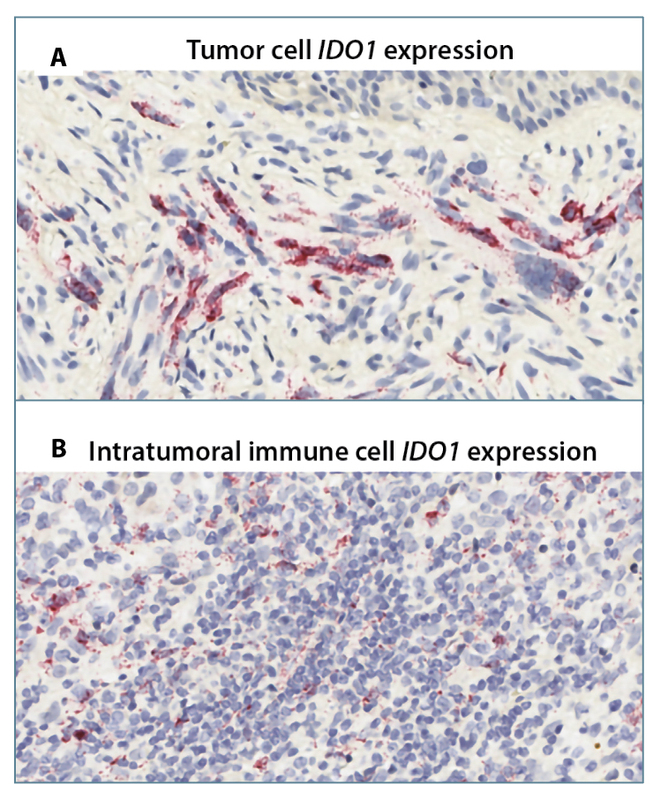 Consequently, immunohistological approaches are being employed to demonstrate IDO1 expression in tumor biopsies. Using RNAscope, ACD’s in situ assay, scientists detected IDO1 expression in (A) tumor cells (red dots) and (B) intratumoral infiltrating immune cells. Exosomes used to be dismissed as experimental artifacts or mere cellular garbage disposal units. Exosomes, however, mediate the local and distant transmission of information between cells and tissues. They play critical roles in signaling and modulating cellular function. Although exosomes have been attracting more attention of late, these bilayer membrane–bound microvesicles still have their hiding places. The exosomes in arthropods, for example, tend to be overlooked. They are being studied, however, by Hameeda Sultana, Ph.D., assistant professor of biological sciences at Old Dominion University and visiting assistant professor in the Division of Infectious Diseases and International Health at the University of Virginia School of Medicine. In a recent study, Dr. Sultana and colleagues showed that exosomes from the tick Ixodes scapularis, which is a model used to study tick-borne encephalitis viruses, are critical for the transmission of Langat virus RNA and proteins from the arthropod to the human host. Tick-borne viruses are critically important in medicine, and have been extensively studied, but relatively little is known about the mechanisms of that facilitate their transmission from ticks to their vertebrate hosts. “Our model explains many aspects about how exosomes are involved not only in the transmission but also in the dissemination of the virus throughout the host,” says Dr. Sultana. Investigators in Dr. Sultana’s lab detected Langat virus infectious RNA and proteins in exosomes isolated from neurons and ticks. “When we extracted RNA from very small numbers of cells, we did not have much success, but we always had equal success with various extraction methods when we extracted RNA from 105–106 cells,” reports Dr. Sultana. Work in Dr. Sultana’s lab detected both negative- and positive-strand RNA in the exosomes. Exosome-mediated transmission of Langat virus occurred via receptor-dependent endocytosis that requires clathrin, and a selective inhibitor of neutral sphingomyelinase, which regulates exosome production and release, decreased exosome viral load and inhibited viral RNA and protein transmission. RNase A studied showed that Langat virus RNA was present in exosomes together with viral envelope protein. “Our lab, which focuses on gene expression, relies on in-house methods of RNA extraction,” says Mario D. Escobar, adjunct professor of biology at Brigham Young University–Idaho. He maintains that his lab sought to develop an RNA extraction method that could match the quality provided by commercial kits—but without the expense. chloroform extraction is more economical, some of this technique’s byproducts may inhibit downstream applications. “Our intention was to find a way to extract total RNA that was capable of maintaining high yield and purity,” explains Mr. Escobar. In a recent study, Mr. Escobar and colleagues reported an approach that uses guanidine thiocyanate, which is less toxic than phenol-chloroform, and generic silica columns to extract RNA. The amount and quality of the RNA extracted from cells using this approach were comparable to those obtained with commercial kits, and the method required about 20 minutes.